A1C/A95C Strike Release with 12vDC/24vDC are continuously rated. These are Low duty Electric Strikes. Surface fix release with packing pieces. Suitable for inward opening rebated doors. Inward opening only. Hi, guys. My name is Darrel and I'm head of the tech team here at LocksOnline.co.uk. Thanks for taking some time to tune in and have a look at one of our product review videos. Today we're talking about strike releases, electric strike releases that are predominately used in access control solutions. The idea here is these particular types of electrical releases allow you to release the latch on a door remotely from an actual door itself. It could be under a counter, could be part of the door intercom system, where you could be speaking to someone at the front door and push a button, and the door would release and they could push the door open. What is actually there in the frame, controlling all that, the chances are, it could be this particular one. This is the Asec A1C or A95C strike release. Now this particular strike release is a little bit different than some of the others on our site. This one is a rim application strike release, so in other words it sits on the frame as opposed to in the frame. On other videos we've done, you've seen it actually gets morticed into the frame; this actually sits on the frame. So this would be ideal for the likes of a Yale traditional night latch. 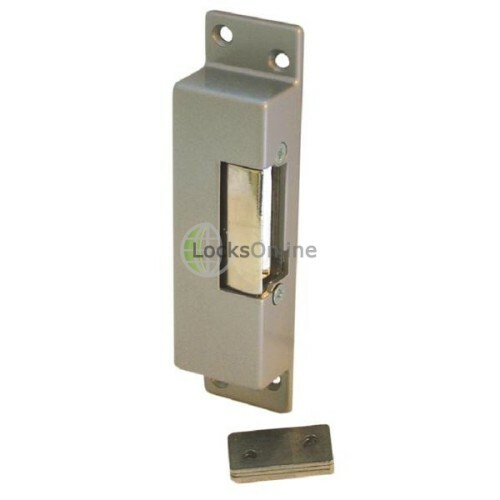 You may be familiar as it being most commonly used on wooden doors, etc., if you've got a Yale type night latch, chances are this is going to work with your night latch no problem at all. Or, you can actually have a standard traditional night latch to work in conjunction with it. Now, this is probably one of the most cost-effective and reasonable forms of producing access control as a passive form of security. Not active, but as a passive form of security, therefore no one could just wilfully walk in through the door and walk in. You've got to be able to control that access. This particular type of strike release is available in 12 volts, AC and DC in a failed locked solution. It's also available in a 24-volt failed locked DC failed locked solution. It's also available in a 12 and 24 volt DC failed unlocked solution. Let me explain a little bit about the difference between the failed locked and failed unlocked. Normally, if you're looking at wanting to put security on a door, and it's part of an access control solution, 90% of the time you would put a failed locked solution on, so that means if your system was to fail, or power was to cut, then your security would not be compromised, the lock would still be engaged and it would keep and it would still be locked. Now, if the power got reapplied, everything would start working fine. Now there are certain types of applications, for example emergency exits or fire exits or something like that, where you have a position where it's part of a way to get through in the event of a fire or something like that, and you need to have a failed unlocked version. So what it would mean is if the power was to fail then the actual release would be open. In other words, the door would be able to be used and it would just be open for people to get in and out. So it's very important for you to think about how you want your access control solution to work. Now, if you're thinking of changing the one you already have or it's broken for whatever reason and you're not 100% sure, normally it should say on it whether or not it's DC or AC. It would be well worth checking. But a little bit of a top tip: if you were to turn around and it used to click when you used to press the button, chances are it's DC, and if it used to go [buzzing sound] like that, like a little bit of a hum, the chances are it may be AC. That will give you some sort of indicator. Now this one that I have here in my hand is actually a failed unlocked version and that means this is open. This is releasable when there's no power applied to it. To get this to lock, we would need to apply power to it, and then it would be in the locked position. So that's basically how they work. This particular kind of strike also comes with some spacers, if you needed to, in order to pack this out, depending on where your strike sits in regards to your latch on the door. So it comes with a couple of packers there. Without further ado, what I'll do is I'll get some measurements for you, and hopefully this will make you better a determination as to whether this is the actual strike that you're looking for. So the actual case width there is 36mm, as you can see there. The overall length from the top to the bottom there is 145mm. Its depth there is 24mm. And its width is the same, obviously, the back there is 35mm. The thickness of the bolt that's in there is, you can go down to around about 9mm, that's the depth of the jaw there, as you can see. So when you actually pull it back there, like that, then that actually goes back on the frame there around 9mm, so it depends on how far your bolt comes out, you would position this so you would only have 9mm actually inside the jaw there. The distance from the face, if this was sitting flush to the end of the actual bolt, if you wanted to be where about is 21mm, and of course that can be packed out with these packers to make it more if you need to do so. The wiring connections, as you can see there, it depends on whether you position it like that or like that, depending on the handling of the door, they're actually sitting underneath there. To gain access to those, you simply undo those two screws there, and the body inside would pull out, allowing you to make the termination. So there you go guys, it's the A1C and the A95C. It's available on our website now, but if you need a bit more information, or you're not 100% sure on anything, by all means just give us a shout. Use our live chat on our website, it's totally free, and you can chat with me or any of the guys. We're all pretty knowledgeable on this particular range of products, but more importantly, we'd love to see you as a customer. So come back and have a chat with us. So from me, Darrel, and all of us here at the LocksOnline team, take care and we'll see you real soon. Bye-bye now. Bye-bye.